The Kál Basin is one of the gems of the Balaton Uplands National Park. Late fall is the time of year when this region becomes serene – away from the hustle and bustle of the summer months, you’ll find a quieter, more accessible Lake Balaton – ready to surprise you with its unique specialties and natural beauty. Here you will find an enchanting little town named Köveskál, an easy 2.5 hour drive from Budapest, and in Köveskál, you will find the Káli Art Inn, a place that everyone should visit at least once. (Please note that you will become a regular, once you have soaked in the tranquil atmosphere.) Ildikó and Csaba Döbröntei, husband and wife in charge of the Inn, will treat you as their most exceptional guest - without being overwhelming. According to them, their staff is all local, coming from Köveskál, or the neighboring villages, with no exception. “They are not professional in terms of graduating from any of the local catering schools, but they are professional in the way they put their hearts in the service they provide and in how they show their respect to our guests,” the Döbrentei couple says. 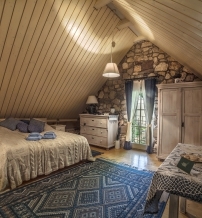 According to them Káli Art Inn is perfect for a long weekend, for those who are seeking romance or just a little peace. They have seen people arrive super-stressed and leave totally relaxed, and couples who arrive arguing and leave like newly-wed lovebirds. Here you wake up to an ample breakfast (without doubt, the very best in the whole country, including Budapest), followed by a long nature walk. 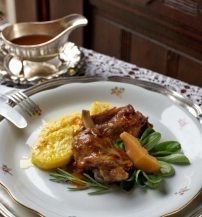 The area is famous for its wine, so prepare for wine-tastings, and also get ready for a hearty dinner at the inn’s restaurant. Most of the veggies, herbs and fruits come from the garden, while other ingredients are sourced from nearby farms and producers, making their delicious meals as green and organic as possible. The main building that houses the restaurant was an officers' casino (mess) around the turn of the century. High ranked soldiers – stationed in the Káli Basin – enjoyed theirs evenings and meals in this beautiful house just as you are invited to do today. The building was bought in 1996, restored carefully and furnished with antiques. In addition to the dining room, you will find a kitchen, an office, a wine cellar, a studio and a library here. 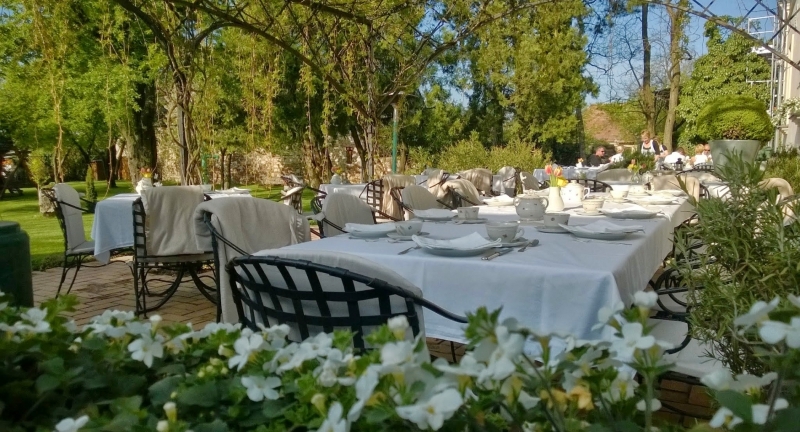 The Inn, with its 14 rooms, surrounded by almond and fruit trees, a balmy lavender garden with a pond nurtured by a natural spring, opened to guests in 2000. Ever since the Döbröntei couple has overseen countless weddings and birthday parties, they say that even trainings run smoothly at this place. The Inn and its restaurant that is often referred to as ‘a small piece of Provence in the Káli basin’ have received numerous Hungarian and international awards, including being chosen one of the ‘100 best hotels in Europe’ by The Sunday Times in 2010. 8274 Köveskál, Fő u. 8.